You just gotta love Yoshiharu Takeuchi, who hired a brand ambassador, travel agent, accountant, general manager, master distiller, janitor, chief cook and bottle washer, the cook, the baker and candlestick maker, and still only has a single employee in his Japanese rum-making outfit Nine Leaves – himself. And lest you think he’s a dour, serious, penny-pinching cost-cutting ninja who’d prefer to be making a Yamazaki single-handedly or something, you can take it from me that he’s a funny, personable, dynamic and all-round cool dude, a riot to hang out with in any bar in any country. Oh yeah, and he makes some pretty damned fine rums. I’ve been writing about Nine Leaves since I first tried their various rums back in 2014: the Clear, and “Almost <<pick your season>>” French- or American-oak-aged rums (most of which were aged, at best, for six months and issued once or twice a year), and have gradually realized that due to the peculiarities of Japanese tax laws, it’s simply not in their interest to make rums greater than two years of age, and so probably never will. Yoshi-san has therefore always concentrated on making minute, infinitesimal improvements to these young ‘uns, until 2016 when he changed direction and put out the first Encrypted rum, riding the wave of finishes and double maturations that have almost come to define Foursquare and have been copied here and there by other distillers like DDL and English Harbour. The Encrypted rums were subtly, quietly excellent. It surpasses my understanding that to this day they have not made much of a wave in the rumworld (unless you count Velier’s 70th anniversary edition, which Yoshi jokingly calls the “Encrypted 2½”), though sales must be brisk otherwise why would Nine Leaves keep making them, right? The Encrypted II from 2017 was a blend of copper-pot-still rums slightly over two years of age: some were aged in ex-bourbon casks, some in PX Oloroso, and then blended, with a resultant strength of 58% ABV. That’s it, and the results just keep getting better over time. Consider the way it smelled. With pot still distillate and two different cask types, one would expect no less than an intriguing smorgasbord, which this provided, in spades: the pot still component was quite subdued, starting off with a little brine and olives, a light touch of nail polish remover and acetones; indeed, the vaguely herbal nature of it almost suggested an agricole wannabe than the molasses rum it actually was. Letting it open a little is key here: after several minutes the other aromas of light vanilla and caramel were joined by smells of apples, green grapes, cumin and lemon peel, and only after some time did heavier fruit like peaches in syrup begin to make their appearance, with a neat balancing act between the various components. The real treat was how it tasted. Short version? Delicious. Much as the nose managed to make a curious combination of agricole and molasses rum work together without going too far on one side or the other, the palate took flavours that might have been jarring and found a way to make them enhance each other rather than compete: it was hot and briny, tasting of gooseberries, green grapes and unripe mangoes, then balancing that off with unsweetened cooking chocolate, licorice, nougat and bon-bons, which were in turn dusted lightly with cinnamon and almonds, before closing off in a nice long finish of nuttiness, caramel, vanilla, a hint of wine and even (I kid you not) tumeric. It’s amazing how many flavours Nine Leaves wrings out of their distillate without messing around with additives of any kind. When I see major houses doctoring their rums and their blends in order to appeal to the sweet-toothed mass market, then justify their actions (assuming they bother) by mentioning lack of resources to age distillate for long periods, the desire of their customers, the permissive legislation etc etc etc, I want to sigh and just point them in the direction of a rum like this one, aged for so short a time, not part of any family tradition or national heritage, not needing any adornment to showcase its quality. This thing is simply a solid, tasty rum, familiar enough not to piss off the Faithful, while also different enough to elicit nods of appreciation from those who’re looking for a variation from the norm. Not many makers can find the balancing point between such different aspects of the production process — Nine Leaves has shown it can be done, and done well, by taking the time to get it done right. Take this as less a review, than a description of my experience with a rum I didn’t know what to do with. I have been sitting on this review for over a year, alternately confused and disgusted and wondering and puzzled. It was a rum like nothing I’d ever had before, tawdry and smelly and meaty, an open sewer of a rum, a discarded tart’s handkerchief, yet I could not believe it could actually be so. No reputable company – no company period – would willingly release such a product into the wild without reason, so what was I missing? Was it me and a degraded sense of smell and taste? Was it – as initially described in my notes – one of the worst hogo-laden bastards ever made, was it a contaminated sample…or a vanguard of the the taken-to-weaponizable-extremes dunder detonations of the New Jamaicans? It took the Velier-issued NRJ TECA specifically for me to go back to this one sample (sent to me by that connoisseur of Asian rum junkies, John Go, who I’m sure is grinning at my experience) and give it another shot a year later, and perhaps it was also the complete faith I had that Luca Gargano would never release a substandard rum, which made me finally come to grips with the TECA’s Japanese equivalent and understand that perhaps they had been ahead of the curve all along. Or perhaps not. Because for the unprepared (as I was), the nose of this rum is edging right up against revolting. It’s raw, rotting meat mixed with wet fruity garbage distilled into your rum glass without any attempt at dialling it down (except perhaps to 40% which is a small mercy). It’s like a lizard that died alone and unnoticed under your workplace desk and stayed there, was then soaked in diesel, drizzled with molten rubber and tar, set afire and then pelted with gray tomatoes. That thread of rot permeates every aspect of the nose – the brine and olives and acetone/rubber smell, the maggi cubes, the hot vegetable soup and lemongrass…everything. And much of that smell of sour funk persists on the taste (you better believe I was careful with it, even at standard strength), though here I must say it’s been transmuted into something more bearable. It’s hot and thin and sharp, reminding me of Chinese 5-spice, coriander, aji-no-moto and ginger with a little soy and green onions sprinkled over a good fried rice, plus sugar water and watery fruits like papaya and pears. Under it all is that earthy and musky taste, not so evident but always there, and that to some extent spoils the overall experience – or enhances it depending on your tolerance for high levels of dunder in your rum. The finish was relatively short and intermediate, with some teriyaki and sweet soya and very faint molasses…and the memory of that lizard. All right so that sounds like crap right? Sure it does. My initial sentiments were so negative I was afraid to score the damn thing. I had never had an experience of such intensity before, of such off-the-wall tastes that I could not seriously associate with rums. And for the record, nobody else I spoke to (those who had tried it) felt the same way about it. So it became a question of seeing who made it and how it was made, to see if that shed any light on the matter. I talked to a few of my correspondents in Japan and came up empty. Yes they knew of the rum, no they had not heard any reports of anything such as I described, and no there was nothing particularly unusual about the production methods employed by Kikusui Shuzo distillery on Honshu, using Shikoku sugar cane which they process on a column still and age for three years. In fact, these boys are the ones making the Ryoma 7 year old rum, which I remembered having similarly odd (if not as feral) smells and tastes, but much gentler and much better integrated into the overall drink. 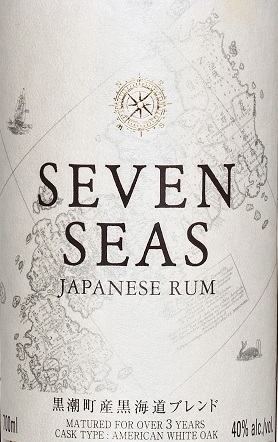 Seven Seas rum is now imported into Germany, but I can’t entirely rid myself of the feeling that it’s really not meant for the export market, which might explain why it’s not mentioned much. On the other hand, maybe rum reviewers are keeling over left and right after a sip but before they get anything to print, so who knows? Anyway, enough of the snark. Bluntly, I tried the Seven Seas in 2017 and didn’t like it and felt it was over the top, a badly made product that was off on balance, complexity and taste. In 2018 Velier’s National Rums of Jamaica convinced me there was method behind the madness, I had perhaps been ignorant and too harsh and that something in the production methodology paralleled the high congener and ester levels of the TECA, even if I could find no confirmation of the matter. Because of the uncertainties I’m going to officially leave it as unscored, because I feel my original 65 was too low but I don’t know enough and feel too ambivalent to rate it higher. Assuming my ideas are correct, then I’d ramp it up to 74….but no more. Even properly made as a true rum, it’s not enough to convince me I want to buy the bottle. I’m fully prepared to accept that my experience may have been unique to me; and I love the funky Jamaican style — but neither point is quite enough to make me want to risk this Japanese rum a third time. Since we’re talking about Nine Leaves again, let me just issue this brief review of another of the 2016 editions, the American Oak 2 year old. This was something of a departure for the company and its genially low-key one-man owner, master blender, accountant, chief salesman, procurement officer, distiller, bottler, secretary, and maybe even floor cleaner, and the departure is in that it’s aged for so long. Most of the time Yoshiharu Takeuchi (who holds all of the positions noted above plus maybe a few others) releases rums in a six month cycle for the Angel’s Half expressions, and annually for the unaged “Clear” ones. This one is, however, aged for two years – it was the first “real” aged edition he made, and it was put to rest almost at the same time Nine Leaves opened for business. Why two years? Because it’s the maximum a rum can be aged in Japan, he told me, before heavier taxes start to kick in, noting also that this is why for the moment older rums will not be part of the Nine Leaves’ stable. Be that as it may, the 50% 2YO pot still rum should be seen as a companion piece to the Encrypted, which came out in the same year, and was also two years old. However, the Encrypted was a two year old finished blend (of four rums), and this rum was a straight two year old without any other barrels aside from the American oak. I tried it together with the that and the Angel’s Half 6-month from last week, at the same time… and somewhat to my surprise, I liked this one best. The nose rather interestingly presented hints of a funky kind of fruitiness at the beginning (like a low rent Jamaican, perhaps), while the characteristic clarity and crisp individualism of the aromas such as the other Nine Leaves rums possessed, remained. It was musky and sweet, had some zesty citrus notes, fresh apples, pears and overall had a pleasing clarity about it. Plus there were baking spices as well – nutmeg and cumin and those rounded out the profile quite well. Palate, short version, yummy. Some sugar water, vanilla, cereals and those spices again, cider and apple juice. No brine here, no olives, more like a kind of tartness, akin to unsweetened fresh yoghurt. And a minerally iodine peat-bog taste lurked in the background, which fortunately stayed there and wasn’t so aggressive as to derail the experience. It was quite smooth, with some edge and rawness, but well controlled, closing things off with a finish that was quiet, clear and relatively easy, redolent mostly of acidic fruits, apples, cider, oranges and a bit of vanilla. That’s a rather brief set of tasting notes, but I assure you, the experience was well worth it. When I posted the Angel’s Half notes last week on reddit, one person asked me whether what I described was typical for Nine Leaves. Based on these three Nine Leaves rums from 2016, I’d have to say yes – but even with rums so relatively similar and from the same tree, there were points of individuality that made them distinct in their own right. Of the three, this one was my favourite – it provided reasonable complexity, clarity, enjoyment, retained its sprightly youth and vigour, while suggesting how the ageing sanded off the rough edges. For a two year old rum made on the other side of the world, this thing is quite an achievement, and demonstrates yet again that a rum doesn’t have to be aged up to wazoo or come from a famed Caribbean estate to make a solid and favourable impression on anyone who tries it. The rum’s label could use some work. It states it’s an Angel’s half but neither the year nor the ageing are clearly noted, which inevitably leads to some confusion. Also, the only way to tell it’s different from the 6 month old is the yellow label for the 2YO, as opposed to the white one on the 6-month. I think Yoshi has corrected this in subsequent releases, though one remains perennially unsure what the release quantity is. Ever since Yoshiharu Takeuchi began his one-man Japanese rum-making outfit called Nine Leaves, I’ve kept a weather eye on his work, and think his two-year-old rums and the Encrypted – both the original and the one issued for Velier’s 70th Anniversary in 2017 – have been remarkably good rums for juice under five (and in some cases under one) years old. Arguably the aspects of Mr. Takeuchi’s work that have brought him to the attention of a greater audience in the Americas — though he’s been well known, and moving around, in the European festival circuit since 2014 — is the release of the Encrypted as noted above, and his current attendance at the Miami Rum Renaissance in 2018…from where Juan Marcos Chavez Paz, a correspondent of mine and a member of the Consumers Jury for the last couple of years, sent me a note yesterday expressing his amazed admiration for the quality of what Nine Leaves does with such short ageing periods. 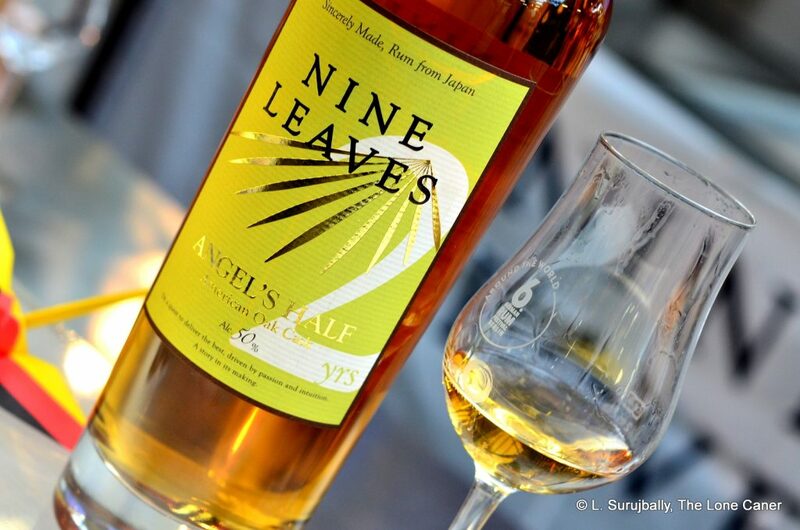 Aside from the occasional two-year-old, Nine Leaves’ bread and butter is the regular outturns of rums which he puts to rest for a mere six months before bottling, in either American oak or Limousin casks. He calls them “Angel’s Half”, which I think is a understated and humorous play on the strength, the ageing and the pilferage of the angels. What this brief stint in the barrels accomplishes is to preserve much of the unaged fire of a white spirit, while also getting the benefit of what Martin Cate would call “light ageing.” However, since these are coming out twice a year, it’s a tough task to try and get them all…the distillery opened in 2013 and while it may not seem to be a problem to get a “mere” twenty or so expressions, trust me, it is. 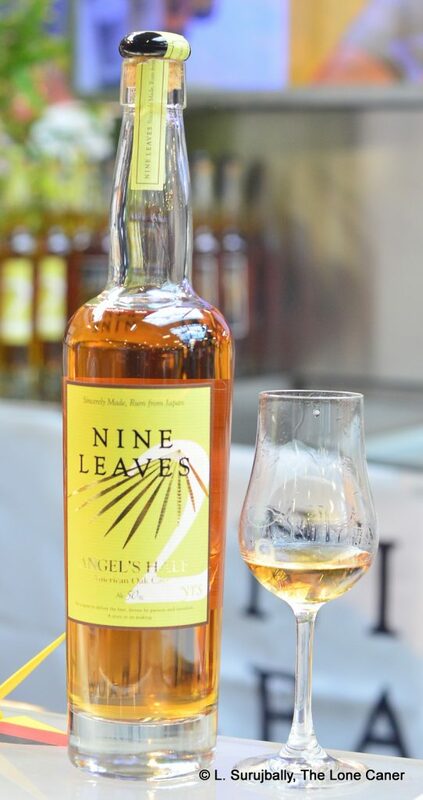 The rum under discussion today is the light yellow Nine Leaves ‘Angel’s Half’ (American oak aged) pot still rum issued in 2016 – not messed around with, bottled at a robust, throat-clearing 50% and as with all the rums from the company I’ve tried so far, it’s a solid, tasty piece of work for something aged less than a year. And that’s the part at which I kind of marvel. I honestly don’t know how he stuffs as much into these rums as he does. The nose, for example, gave an initial sensation of a wet stone and minerals (!! ), salt, sweet peas (I’m not making this up, honest), before relaxing with the weird stuff and presenting something a tad more traditional – sherry, brine, an olive or two, watermelon, pears and a light kind of sweetness that’s quite pleasing. And quite assertive, but without actually crossing over into rough. The palate was deceptive, because although the dominating flavour at first sip was swank and a freshly sliced watery pear, it evolved subtly over time, in spite of what appeared to be a certain light delicacy behind which reticent flavours hid and never wanted to emerge. Wait a while and take your time, as I did – since, once it opened up, crisp, solid tastes were to be found. Brine, olives, gherkins, cucumbers to start, mellowing out into light fruits, a bit of lemon zest, nutmeg (very faint), guavas and just a suggestion of creaminess I could not nail down more precisely. Surprisingly, the finish was rather short for something bottled at 50%, and was quite dry, somewhat less than nose and palate suggested could be found. Some watery fruits, a bit of brine, the sweet line of citrus and spice, and that was that. Thinking about the rum as I jotted down my notes, I think the key to the experience is in understanding its rather unstudied and deliberate eschewing of off-the-wall complexity. That’s not its intention, because there’s not that much going on here, no kaleidoscopic taste-attack to the senses as defined by some of the unaged white rums I’ve written about; in a way it’s a tamed version of those, with more than enough subtlety imparted by the time spent in the barrel to elevate it (now that I consider the matter, in a way it reminded me of the unaged Kōloa Kaua’i Hawaiian Rum I tried back in 2012). In other words, it’s two steps above merely “simple”; it’s clear and crisp and has the notes it plays, and plays those exceedingly well. I quite enjoyed it. Conversations like the one I had with Juan makes me glad I invest the time into doing company biographies that provide background for the aficionados, because it’s clear that the interest is there and it’s really just the rums that aren’t always available. Fortunately Yoshi-san is not slowing down and keeps the quality of his juice very high (Velier would hardly have asked him to contribute to the 70th Anniversary collection otherwise). The chance that one day boredom will set in and I stop trying Nine Leaves’ “sincerely made rums” is small indeed, especially when there’s a range of young stuff like this to be savoured. Here’s a company that will hopefully gain even greater recognition, acclaim and plaudits in the years to come than those they have already earned. Unsure whether this one is the Spring or Autumn release, since the label doesn’t mention it. Since I tried it in October, I’m going to suggest it’s Spring. 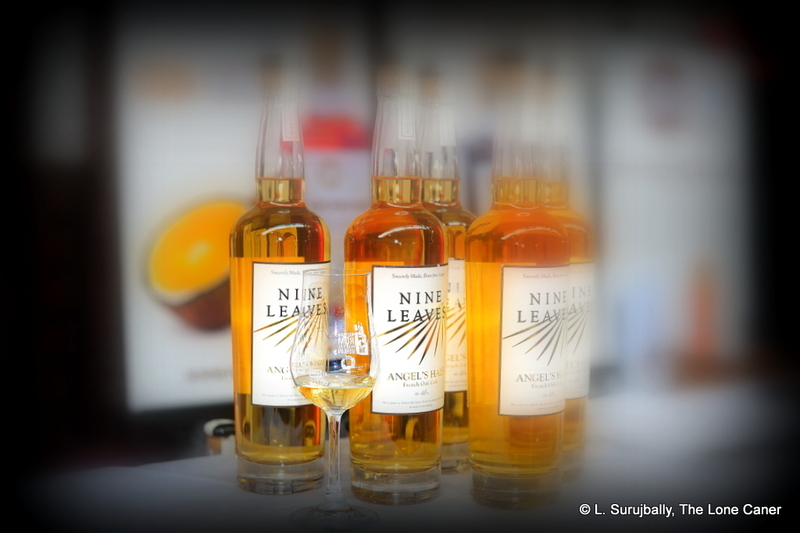 Nine Leaves, for whose intriguing rums I have always retained a real fondness, remains a one man operation in Japan, and while I have not written much about them of late, they continue their regular six month release regimen without pause, and have become must-stop booths at the various festivals they exhibit at on the Circuit. Every now and then they issue an expression somewhat at right angles to their regular “six-month-aged” line, such as the Velier 70th Anniversary edition from 2017, the two-year-old “Encrypted” from 2016 and this one-year-old from 2015, which was the commercial 48% variation of special 58% 60-bottle run for a Japanese hotel, aged in Cabernet Sauvignon wine casks instead of the regular American or French oak. So, this is a pot still rum, aged for one year, bottled at 48%, and aged in red wine casks. How active or soaked these casks were, or how much residual wine there was, remains an unanswered question. The real question for me was, did it work? Nine Leaves, after all, have made some rather above-average rums by bucking the trend and staying within some very short time-frames for their ageing, but now this one seemed to be inching towards the line that the Encrypted stepped over the following year. How was it? Well, nose first. It moved on quite a bit from the 2015 Clear (which I enjoyed for other reasons). Though it began with some rather startling waxy paraffin aggressiveness, it was not as pungent as the Clear was, and seemed somewhat more tamed, more soothing. In fact, it presented very much like a young agricole with a few extra aromas thrown in. The winey notes were there, kept well in the background – more of an accent at this stage, than a bold and underlined statement – and the smell exhibited a sort of clear, sprightly friskiness, of fanta, grapes, cinnamon, ginger and light florals. That clarity of aromas was very evident on the palate as well. Even at the slightly beefed up strength it remained light and clear and crisp. Flavours of light flowers, vanilla, green grapes, lemon zest and olives in brine mixed it up with salt butter and cream cheese. The wine background came forward here, and if it wasn’t bottled at such a proof and had so many other interesting rummy sensations, it might even be considered a port of some kind. It was quite intriguing and quite interesting, though the finish was a bit of a let down, being very spicy, quite dry, doing something of a turn towards harshness, and didn’t give much up beyond some green grapes and grass, and a few breakfast spices. Although it was a decent rum, I think it may be a bit too ambitious, and could best be considered an experimental attempt by the playful for the curious (and the knowledgeable), to make something at odds with better known profiles. The real success stories of such rums seem to be more with finishes than the entire ageing cycle. To some extent it lacked focus, and the wine background, while making its own claim to uniqueness, also confuses — and although I kinda liked it, the amalgam of rum and wine doesn’t gel entirely. If you recall, Legendario and Downslope Distilling went down this road before, much more unsuccessfully – it’s a tough balancing act to get right, so kudos to Nine Leaves for doing as well as they have. Anyway, to wrap up, then– points for the effort, a few approving nods for originality, but ultimately also something of a headshake for not succeeding entirely. Given that there has never been another major attempt to issue a wine-aged young rum from the company, it’s possible that was and remains an experiment which was left alone after the initial release, which is a shame, really, because I would have enjoyed seeing where Yoshi-san took it after a few more tries. 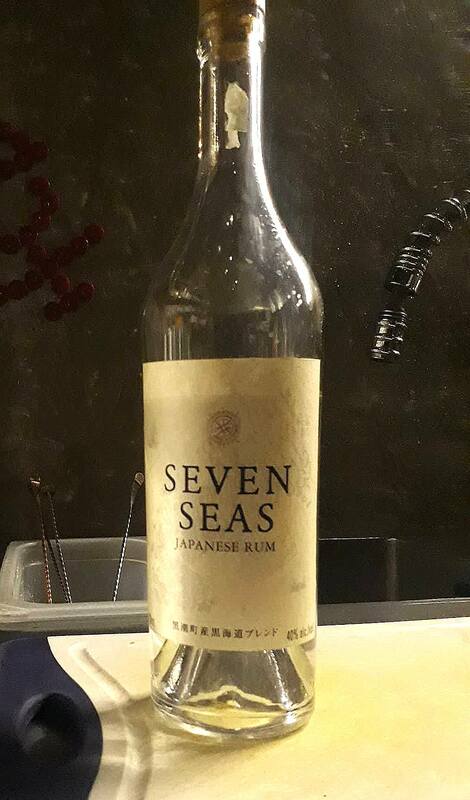 A recent post on the reddit rum forum – perhaps the only real Q&A alternative to FB rum clubs on the net – remarked on the discovery by one person of Japanese rum, using the Ryoma 7 year old as an example. Having written about that particular product – I thought it an interesting essay in the craft, having a profile both similar to and at odds with, more traditional rums with which we are more familiar — I remembered this other one by Ogasawara which I bought in Paris last year, and decided to jump it to the front of the queue. I have to confess that the initial sensations on the nose were absolutely not my cup of tea (my notes read “shudderingly weird”), right up to the point where through some magical transformation the whole thing did an ugly duckling on me and (somewhat amazingly, from my perspective), turned into quite a credible swan. It started off with light oil and petrol, and was really briny, like a martini with five olives in it, leaving me wondering whether it was a pot still product (I never did find out). In its own way it seemed to channel a cachaca, or unaged juice straight from the still, except that it was too unbalanced for that. There was white pepper, masala, sugar water, cinnamon, a flirt of watermelon and pears, and a bouillon with too many maggi-cubes (I’m not making this up, honestly). Somehow, don’t ask me how, after ten minutes or so, it actually worked, though it’ll never be my favourite white rum to smell. 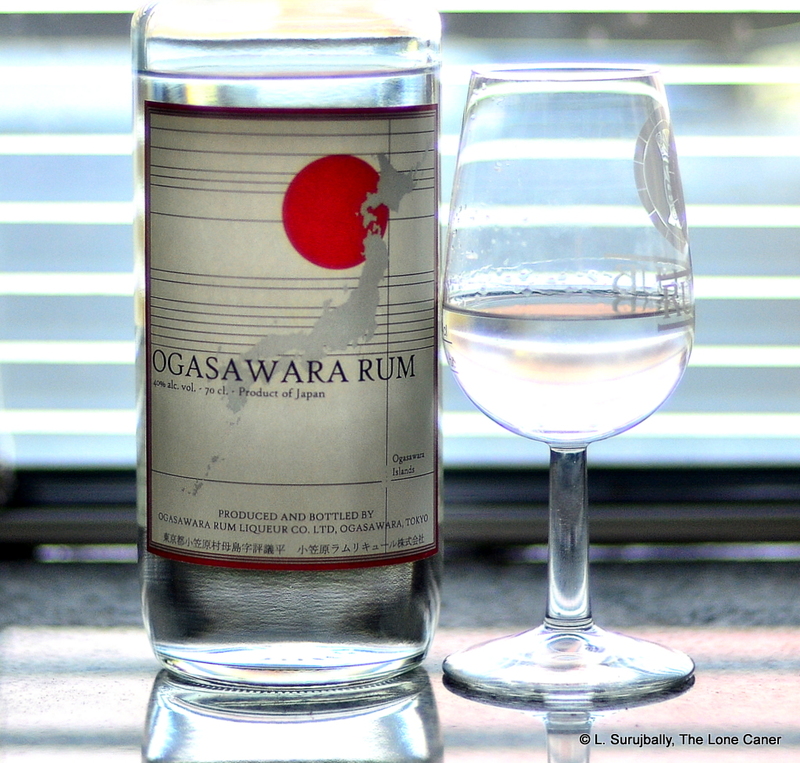 Fortunately the Ogasawara settled down and got down to rum business on the palate, which was very pleasant to taste. The 40% helped here, lending a sort of gentling down of the experience. It presented as reasonably warm and smooth, the salt disappeared, leaving a light and sweet sugar water and watermelon tastes flavoured with cardamom, mint and dill, with traces of vanilla and caramel. Water brought out more – very brief and very faint notes of olives, fusel oil and delicate flowers which gave some much-needed balance and character to the experience. Although it was a molasses based product, it seemed to channel elements of an agricole spirit as well, in an interesting amalgam of both — something like a Guadeloupe white rhum, just not as good. But if one were looking for a true molasses rum redolent of the Caribbean, forget it – that wasn’t happening here: it was too individual for that. The finish was probably the weakest point of the whole affair, here one moment, gone the next, warm, light, clear, but hardly remarkable aside from a quick taste of cinnamon, cardamom, and sweet rice pudding. The Ogasawara islands are also known as the Bonin (or “uninhabited”) Islands and are part of an archipelago of that name. The first Europeans are said to have come in in 1543 (supposedly a Spanish explorer, Bernardo de la Torre); one of the islands, Hahajima was originally called Coffin Island or Hillsborough Island and settled by a few Americans and Europeans and other pacific islanders around 1830. One of them, an American called Nathaniel Savory, traded bathtub-style hooch (I suppose they could be called rums) made from locally planted cane with whaling ships. By 1880 they became administratively a part of the Tokyo prefecture, and the commercial cultivation of sugar cane and sugar manufacture dates from this period. Rice based alcohols are of course a tradition in Japan but rums in the modern sense of the word have only existed since 1940 or so – however, most are classified as shochu for tax reasons (rum is taxed more heavily). 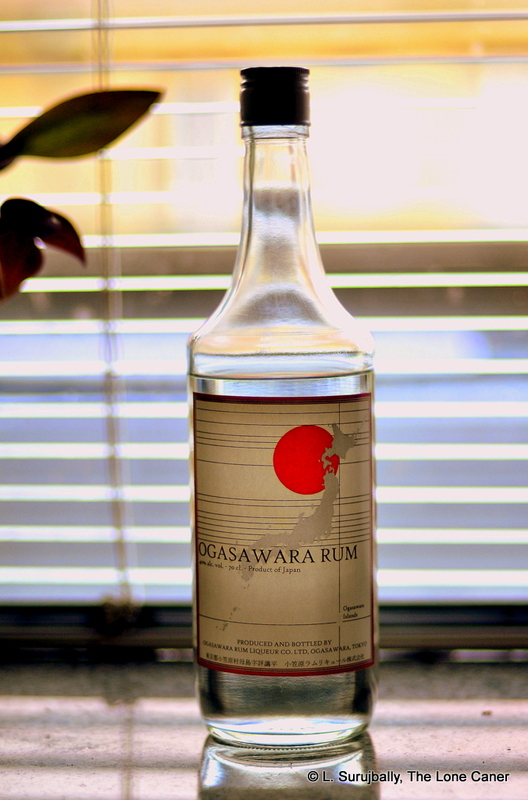 Placed under American control after the end of World War II, the Islands returned to Japan in 1968, and after many years of efforts to reinvigorate the culture of sugar cane which existed on the island before, Ogasawara Rum Liqueur Company was founded and its first put rum on sale in 1992. They still don’t produce much of a range. Not much info on the rum itself is available. I was informed via a Japanese friend of mine that it’s double-distilled in a stainless steel pot still. There are stories about how it was aged for under a year on the sea bed by the source islands, but I’m not clear whether it’s this rum, or a rum made on Ogasawara and where the title is used as an adjective. Plus, if it was aged that way, it had to have been filtered, again without confirmation of any kind. So this turned into one of those occasions where I really did taste it blind, and what you’re getting is an unvarnished opinion of a rum about which very little is known aside from strength and basic source. As a person who has had rums from all over the world, I am a firm believer that terroire and culture both impact on the rums various regions make, which is why you’ll never confuse a Bajan with a Jamaican, or either with a Martinique rhum, for example (or with a Guyanese wooden still product). Japan’s small and venerable producers, to my mind, benefit from their unique Okinawan cane (much as Dzama rhums on Madagascar do with theirs) as well as being somewhat limited by their predilection for sake and shochu, which are quite different from western spirits and impart their own taste profiles that define and please local palates. Given its vibrant whiskey industry and lack of attention to our tipple of choice, it’s clear Japan still has some catching up to do if it wants to make a splash and win real acceptance in the wider rum world as a producer of a unique variant of rum. 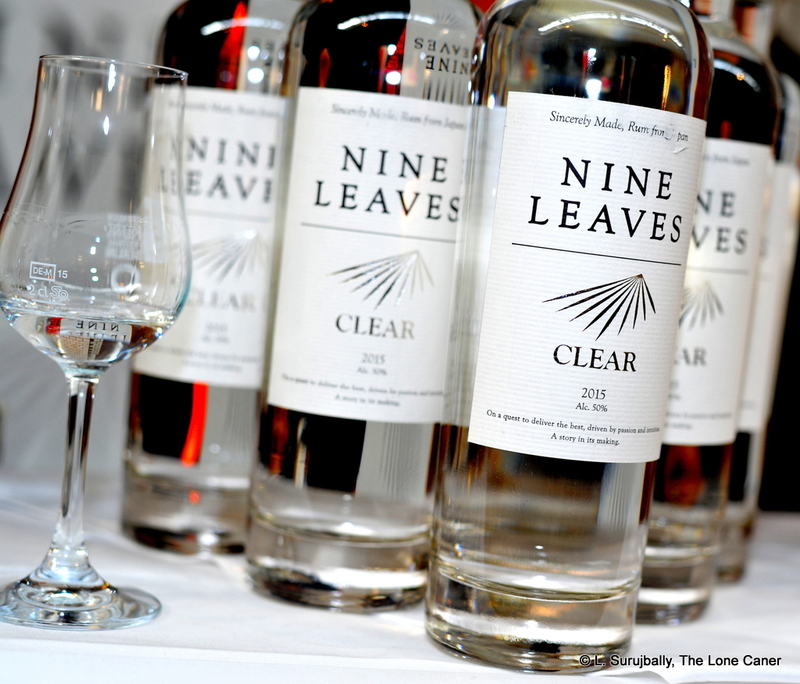 Nine Leaves is already making strides in this direction, and it remains to be seen whether other small (or large) producers will edge into the market as well. If they do, it’s going to be interesting to see how they approach the making of their rums, the marketing, and the disclosure. A new direction for the Japanese rum-maker, which has some flaws but is an interesting rum nevertheless. When researching the background for the Encrypted, I came across the website RumRatings, which is a place where people rate and comment on rums they have tried without going through the effort of, say, creating a website or putting their thoughts on a more formal basis (the way one sees on the /r/rum forum on reddit, for example, a site where fans can be even more rabid than on Facebook). The comments were not inspiring. “Too young and harsh and chemical,” wrote one from Hungary whose tastes ran into the sweet of Dictador, Millonario and Zacapa; “This sh*t is a waste of time,” opined another from Romania, who headed his less than enthusiastic comment “Whisky Rum or something…” and who also (from the link to his “cabinet”) seemed to prefer softer soleras and sweeter rums and put the Jamaican RumFire and a Bristol Spirits 1996 Caroni close to the bottom. Such criticisms serve a purpose in this instance, because there aren’t many reviewers who have yet taken to Nine Leaves, so even an opinion from the street is useful when we buy one…and just because I like ‘em personally doesn’t mean you will. So I don’t link to these negative remarks in an effort to diss the gentlemen in question or to sneer at their opinions, just to lay the groundwork for suggesting that if your tastes run into the more easy-going, softer Spanish style of rums – or those that are known by now to be sweeter than the norm — then this Company’s rums might not be in your wheelhouse. 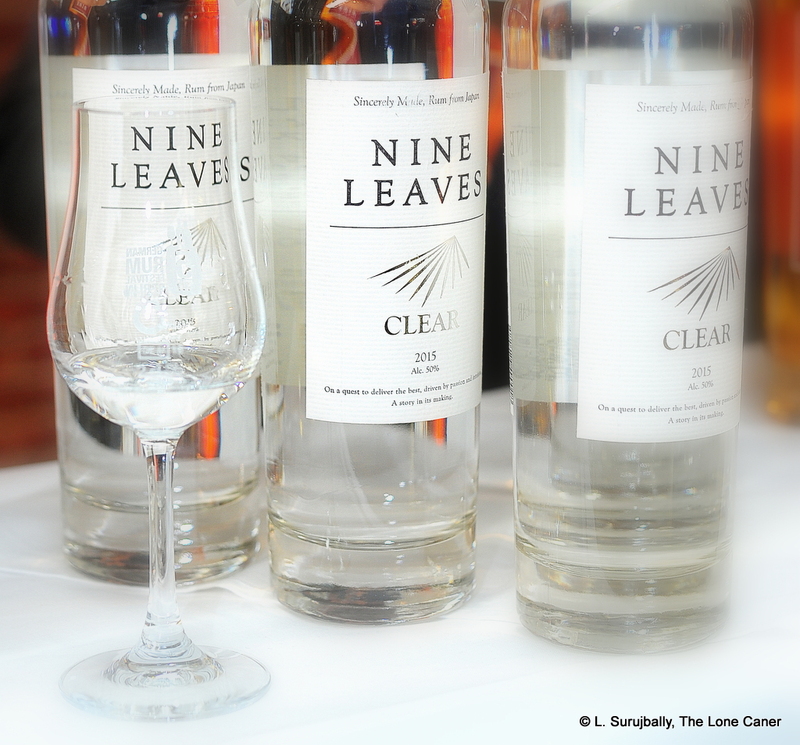 Nine Leaves aren’t as individualized as, say, unaged cask-strength agricoles from a pot still, but their rums do take some getting used to. 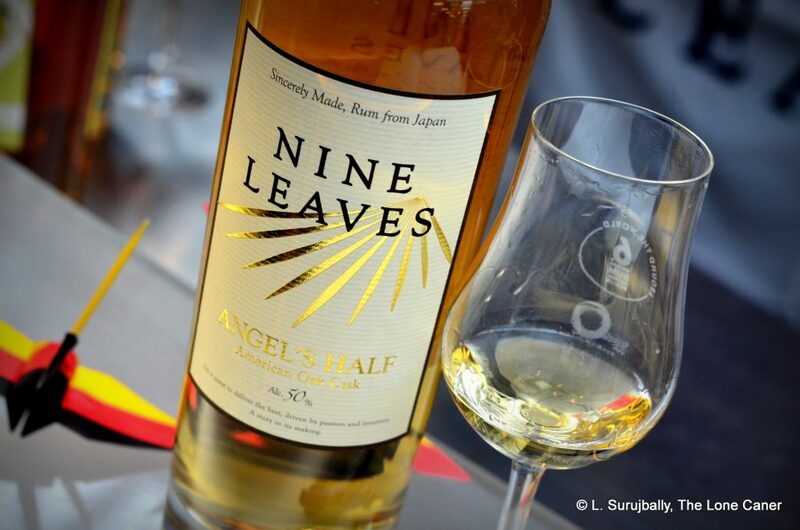 Nine Leaves, that one-man outfit from Japan makes very young rums (most six months or so), and they are closer in profile to a mashup of whites and Jamaicans with the leavening influence of Barbados thrown in, plus maybe a clairin or two for some fangs. Yoshiharu Takeuchi makes no attempt to be particularly unique, which is perhaps why his rums actually are. And of all those Clear and “Almost <<pick your season>>” French- or American-oak-aged six month old rums, I’d have to say he’s done something pretty interesting here, like nothing he’s attempted before. He’s thrown kaizen out the window and gone in a new direction. Consider: normally Nine Leaves distills its rums, does the cuts, and then ages the result for six months, which is why there are a bewildering array of multi-years Almost Springs and Almost Autumns and Angel’s Half French and American Cask Aged rums in their portfolio; but with the Encrypted, he has gone in the “finishing” direction (much as English Harbour, DDL and FourSquare have done in the past year or two). This is a blend of four rums, each two years old – the four were aged in barrels of American oak, barrels that previously held oloroso, brandy…and one that remains unidentified, perhaps in an effort to tease Florent Bouchet of the Compagnie, who occasionally holds a distillery of origin to be “secret”, leading to tons of heated conjectures and endlessly entertaining commentary in the blogosphere. 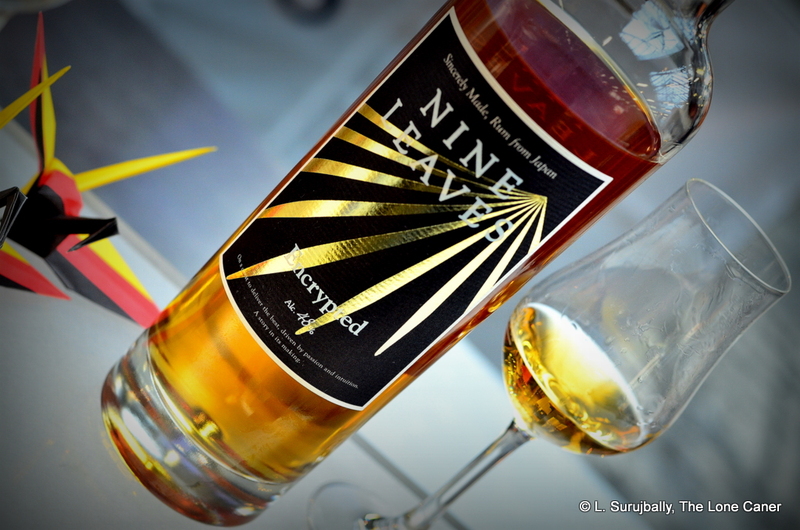 The closest Nine Leaves has previously come to this concept is with their Sauvignon Blanc edition, but the ultimate intention is the same — to add to the flavour profile without actually adding anything, a tactic Zacapa, A. H. Riise and Don Papa could perhaps take note of. Bottled at a firm 48% in 2016, the golden rum is certainly a step above their younger products. All share a somewhat astringent, rather thin-but-intense nose (I’m trying hard not to think of my feared primary school teacher, the redoubtable Mrs. Jagan, with her sharp voice, pince-nez, bladed nose and ever-ready foot-long ruler but that’s almost impossible), and here that was only marginally ameliorated by the ageing period. Sharp for sure, acerbic yes, intense without question – but the aromas weren’t half bad. Citrus, light florals, some earthiness and lavender doing an interesting tango, plus the vaguest hint of fruits and grassiness, all very crisp and distinct. It presents far more like an agricole than a molasses based rum. The two years of ageing was where to some extent the rum failed to deliver when tasted, however promising the nose had been. The crisp clarity was retained, yet it still presented as somewhat raw, a shade too uncouth, without any rounding that would have made the mouthfeel better. Fortunately, that aside, the taste was excellent, and once I got used to it, I found myself appreciating its sprightliness and youth, and again I was left wondering how this was so much like an agricole. Those same vegetal, grassy notes persisted, to which were added florals, red wine, orange zest, sultanas, and also a sort of cereal background that developed into the creaminess of cheese on black bread. It was odd, but came together quite well, and I had no real complaints about the finish, which was somewhat spicy, but still exited with a cleanliness and clarity redolent of the spicier tartness of green apples and grapes. Outside the cognoscenti, the rabid fanbase or deep-field researchers, few know (or care) much about rums from outside the Western hemisphere. Yet rums from India and Thailand and Australia are massive sellers in the East, to say nothing of the emergent makers from Japan. 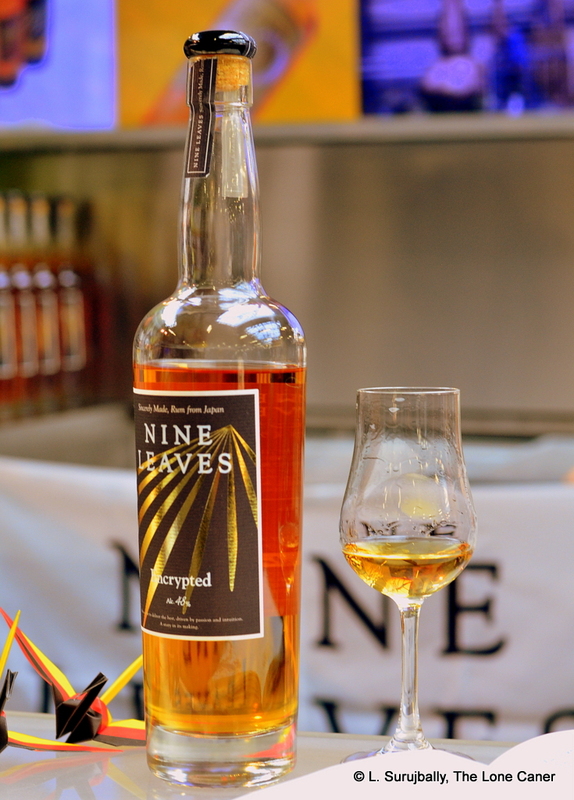 Nine Leaves is the newest outfit from the Land of the Rising Sun to garner major accolades in the larger rumiverse, but rum has been made from locally grown sugar for a very long time, and it’s no surprise that other companies have been quietly doing business in the spirit without many outside the region being the wiser. Whisky might be the Japanese attention-getter du jour, but I don’t review those, so let’s turn a small spotlight on to the rums instead. One such is this very interesting pale yellow product from the Kikusui distillery, located in the Niigata Prefecture on the north coast of Honshu — they also make, and are mostly known for, sake. The Kikusui brewery was formed in 1881 by Takasawa Suguro, when he received the right to make it from his uncle Takasawa Masanori and was approved to make it in his own right in 1896. It remains a family business (into its fifth generation), with sake remaining the mainstay of the company (one can only wonder who the rum loving guy in the family was, who broke with tradition by making it). In the first century of its existence, the company was not a large one, and weathered many storms like shortage of rice, the war years, sickness and premature death of family members, floods, earthquakes – in 1964 the brewery was damaged by earthquake and for two consecutive years floods destroyed what was left. Somehow the family kept going and in 1969 a replacement brewery was completed. New equipment, modern production methods and management techniques were introduced in the 1970s. In the 1980s and 1990s the company branched out into canned sake, food dishes and even stores of its own. Sometime in the 2000s, as best as I can determine and perhaps as a result of western influences or lack of desire to go with whisky, it was decided to branch into rum. The sugar cane from which it is made comes from the southern island of Shikoku, the smallest island in the chain, and the rum derives from freshly pressed cane, which would make it a Japanese agricole, as well as putting to the test my own theories about whether terroire really does have a major influence on the final product. There is no information on whether the rum is pot still or column still derived; it’s aged for seven years in American oak barrels, and issued at 40%. There you go. It’s been a while since I tried a rum with an olfactory profile quite like this: it started out with a wet cardboard soggy mess (the cardboard that the aroma implied, that is, not the rum); and cereals, rye bread, coconut water, rotting fruit (it was gentle, for which I gave fervent thanks), which over time, developed into a very pleasant nose of apples and cider, oddly sharp and weak at the same time. It was very light, faintly sweet, and could not for a moment compare to the clear voluptuousness of a Caribbean agricole, yet it presented an intriguing profile of its own that was almost Jamaican, and marked it out as singular – clearly, one had to be prepared to take a sharp left turn to enjoy it and not demand it adhere to a better known French island smell. I can’t say with conviction that I succeeded…but I was intrigued. The palate was just as interesting, if equally bizarre. To begin with, it was very different from the way it smelled – it was clear and crisp on the tongue as any cane-juice-derived rum ever made, extraordinarily light and clean for something supposedly aged for seven years, and tasted of light sweet grapes (those red ones from Turkey, or the green ones from Lebanon my wife buys for me), cucumbers, dill, and very light notes of vanilla, green apples, flowers, green tea ice cream, pears, some smoke, and a vague soya sauce background. In other words, the dreadlocks to a big step backwards. It was sprightly, light, crisp. Too bad the finish decided to circle back to the beginning, and end things with more of those fruits that had gone off, and that wet cardboard, tied in a bow with olives and brine. A little was okay, too much kinda soured on me. So…I enjoyed the offbeat, original taste, liked the crispness of the mouthfeel, and was okay with the edges front and back, yet there was something uninspiring about the experience taken as a whole. It’s possible that both terroire and the company’s expertise with (or preference for) sake tilted their philosophy to something at odds with more familiar rummy profiles; and of course the 40% while allowing a wider audience to be catered to, does impose some limitations. Still, I’ll say this – it is emphatic for what it is, and as a rum it sure makes its own statement. There’s more than a bit of unaged pot still profile in here (hence my unconfirmed suspicion that this is what they are using to distil it), but for that to take a more commanding stance requires moving above the issued ABV and maybe playing with the barrel strategy some more. At end, therefore, it exhibits both strengths and weaknesses. Why did I buy this? Well, because I could, because I was interested, and because it’s informative and useful to write about more than just the regular crop of rums from the regions with which we are all familiar. We should look to expand our horizons, and if the experience is not always an unadulterated positive, who can say what others might like, what the company’s ten year old is like, or where it moves in the future? 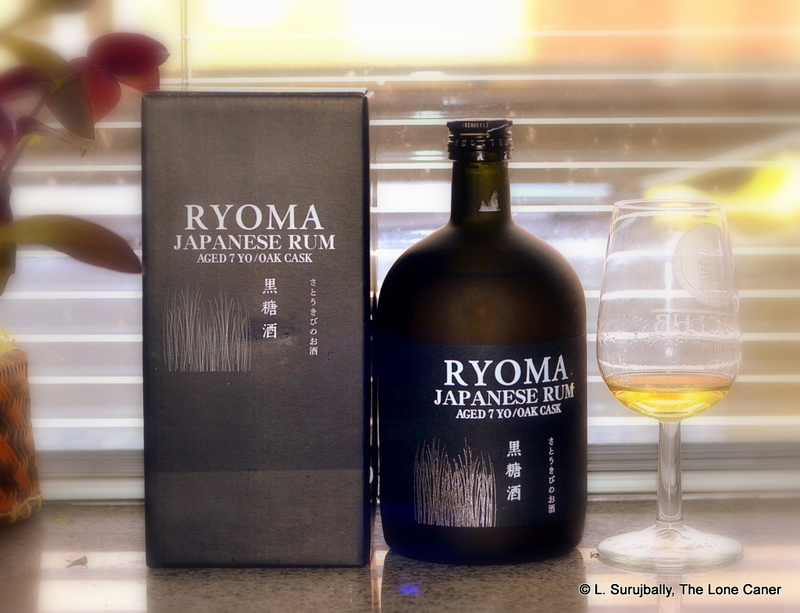 Happily, the Ryoma 7 year old rum exhibited more on the plus side of the ledger than minuses, was a sprightly, funky little rumlet, and is quite affordable for anyone who wants to take a flier on something off the beaten track. The name “Ryoma” (or Ryōma) is that of one of the revolutionaries of the Meiji era who was prominent in the movement to overthrow the Tokugawa shogunate (he was murdered in 1867). That name in turn derives from a legend of a god with the head of a dragon and the body of a horse, which supposedly could run 1000 li in one day. A quite serviceable, unmessed-with white rum from Japan, steering a delicate middle course between sleaze and decorum with less than complete success. Nine Leaves, that always-interesting one man operation out of Japan, doesn’t find much favour with Serge Valentin, who has consistently scored their rums low, but I’ve always kinda liked them myself. The 2015 edition of the “Clear” is a case in point, and showcases the move of some rum makers into white, unaged, unfiltered, full-proof, pot still products. The aren’t for everyone, of course, and may never find broad acceptance, since they always feel a shade untamed – in that lies their attraction and their despite. I get the impression that most of the time cocktail enthusiasts are their main proponents, aside from writers and enthusiasts who love sampling anything off the beaten track. Such white rums share several points of commonality. They have a raw-seeming kind of profile, channel the scents of a starving artist’s one room studio (or maybe that of a dirty chop shop garage in a ghetto somewhere), and often feel a tad boorish to taste. But as part of the great, sprawling family of rum, I recommend them, especially if they’re decently made, just so people can get a sense of how wide-ranging the spirit can be. And this one isn’t half bad. What Nine Leaves did here was make a rather tamed version of the savage Haitian or Brazilian unaged rums which are its first cousins. Now, when poured and sniffed, it billowed up very aggressively (as one might expect from a popskull brewed to a meaty 50%), and the strong smell of fusel oil, wax attacked right away – pungent is as good a word as any to describe it, and it reminded me strongly of the Rum Nation Jamaican 57%, or even, yes, any of the clairins. But it nosed in a way that seemed more rounded and less jagged than those elemental firewaters. And while I didn’t care for the scents of paraffin and cheap lye soap (of the kind I used to do laundry with by the side of nameless rivers in my bush days), there were gradually more assertive, sweeter smells coiling underneath it all…sugary water, watermelon, cinnamon and nutmeg. These lighter hints redeemed what might otherwise have just been an unsmiling punch of proof. As I noted with the cachacas last week, the dry, sharp and sweet taste was something of a surprise, coming as it did at right angles to the preceding pot still heft. Salty green olives and more sugar water melded uneasily and eventually made an uneasy peace with each other, to develop into a more easy going, even light, palate redolent of more watermelon, cane juice, with some of that thick oily mouthfeel that characterized the Sajous, or the Jamel. There were some green apples, florals, and half ripe mangoes (minus the mouth puckering tartness), even a shaving of lemon zest…however they all seemed to suffer from the issue of not knowing whether they wanted to go all-in and define the product as a rampaging pot still rum squirting esters and fuel oil in all directions, or be a lighter, sweeter and more nuanced, well-behaved rum that would appeal to a broader audience. The finish suggested more clearly what the originating vision behind the rum had been – it was long, very long, a little dry, with sweet and salt finally finding their harmonious balancing point and providing a lovely ending to what had been a pretty good all-round (if not earth-shattering) experience. It’s rich, yes, vibrant, yes, tasty, yes. What was lacking was a little integration and balance, a bit more arrogance in the trousers, so to speak. But don’t get me wrong. Mr. Takeuchi knows what he’s doing. He’s got time, patience, kaizen and some pretty neat tech backing him up. He likes what he does, and makes what he does quite well. This rum may be a smoothened-out, vaguely schizoid clear rum more akin to an unaged agricole — in spite of being made with molasses, from Okinawan sugar – but it still scores and tastes in the region of the clairins and other white rums that I may have raved about more enthusiastically. My recommendation is to ignore the score, and simply try the rum if you can. You will likely be quite pleasantly surprised by how well an unaged rum can be made. And how nice it can taste, in its own understated way. Distilled on a copper Forsythe still. There are still no plans to issue rums older than two years, for the moment. It’s an old joke of mine that Nine Leaves’ staff consists of a master blender, office assistant, purchasing agent, bottler, General Manager, brand ambassador and sales office, and still only has one employee. This was and remains Mr. Yoshiharu Takeuchi, who single-handedly runs his company in the Shiga Prefecture of Japan, and basically issues some very young rums (none are older than six months) on to the world market. The unaged whites in particular are getting all sorts of acclaim, and I have one to write about in the near future. Back in December 2014 I wrote about the six-month-aged 2014 French Oak, which I thought intriguing and pleasant to drink, though still a bit raw and having some issues in the way the flavours blended together. Running into Mr. Takeuchi again a year later, I made it a point to try that year’s production, the The American Oak “Spring 2015” and this “Autumn 2015” … and can happily report that Nine Leaves, in its slow, patient, incremental way, is getting better all the time (and as a probably unintended side-effect, has made me buy a few more Japanese rums from other companies just to see how they stack up). Just a brief recap: the rum was distilled in a Forsythe copper pot still, double distilled, using sugar cane juice from cane grown in Okinawa, so the rum is an agricole in all but name. Mr. Takeuchi himself decides when and how to make the cuts so that the heart component is exactly what he wants it to be. The rums are then aged for six months in the noted barrels, which are all new, and lightly toasted, according to a note Mr. Takeuchi sent me.. The French Oak “Autumn 2015” rum was a bit lighter in hue than the American Oak version I tried alongside it, and also a little easier on the nose…and smoother, even rounder to smell, in spite of its 48% strength. There was a subtly increased overall depth here that impressed – though admittedly you kinda have to try these side by side to see where I’m coming from. Aromas of fanta, orange, cinnamon, vanilla were clear and distinct, as clean and clear as freshly chiselled engravings, and after a while, sly herbal and grassy notes began to emerge…but so little that one could be forgiven for forgetting this was an agricole at all. 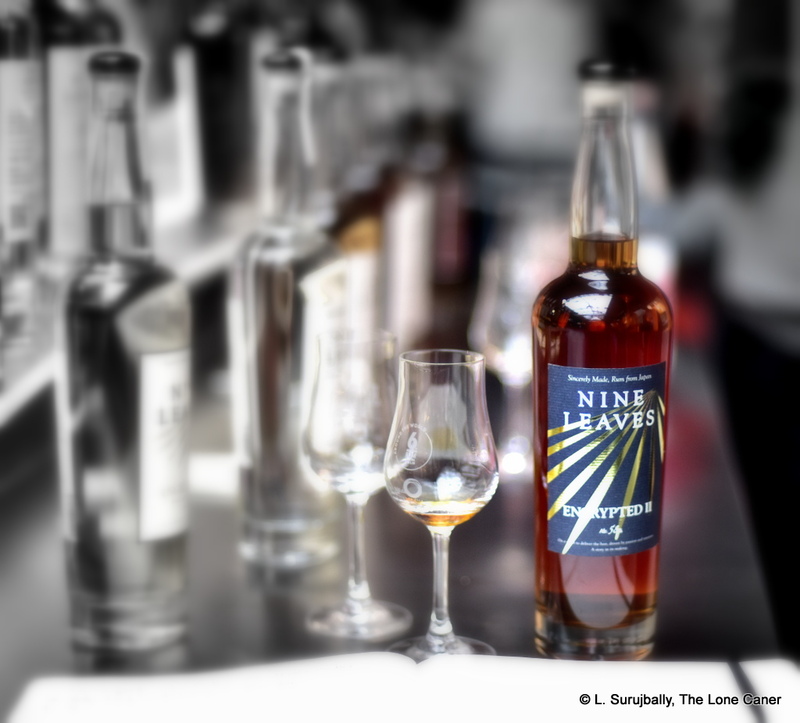 This was something I have enjoyed about Nine Leaves’s rums, that sense of simultaneous delicacy and heft, and the coy flirtation between molasses and agricole profiles, while tacking inobtrusively to the latter. The profile on the palate continued on with that subtle dichotomy – it was slightly sweet and quite crisp, beginning with some wax and floor polish background, well controlled. Sugary, grassy tastes of cane juice, swank, vanilla, some oak, dill and incense led off, and while it displayed somewhat more sharpness and a little less body than the roundness of the nose had initially suggested, further softer notes of watermelon, cucumbers and pears helped make the experience a bearable one. As with the American, there was a chirpy sort of medium-long finish, as the rum exited with dry, bright, clean flavours of citrus, breakfast spices, some cinnamon and maybe a touch more of vanilla. It was clearly a young rum, a little rambunctious, a little playful, but overall, extremely well behaved. I sure can’t tell you which agricole is exactly like it – Nine Leaves inhabits a space in the rum world uniquely its own, while never losing sight of its rummy antecedents. That’s always been a part of its charm, and remains a core company competence. 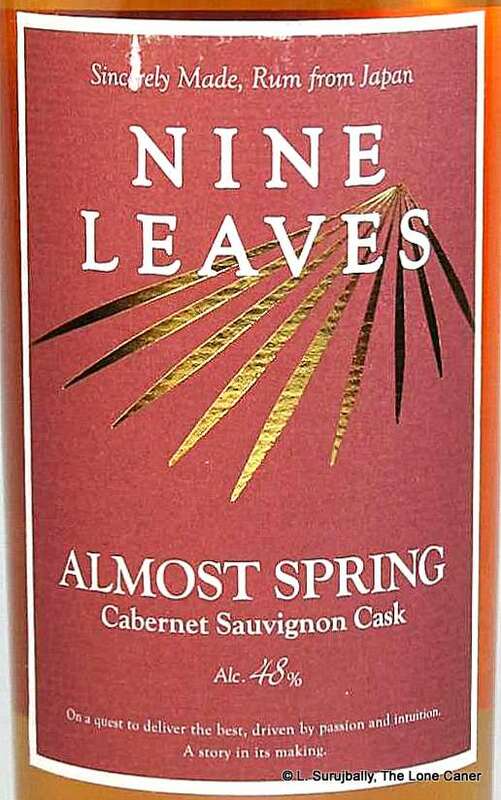 Clearly Nine Leaves is slowly, patiently improving on its stable of offerings. I spent a few hours checking for news that the company intends to issue progressively more aged rums without result – it seems that the current idea is to continue with gradually improving the young rums that area their bread and butter (though I know that Yoshi has a few barrels of the good stuff squirrelled away in his warehouse someplace that he isn’t telling us about, and will issue a two year old American oak rum as a limited edition at some point). I can’t fault the concept, and if a new distiller can make rums this decent, and improve a little bit every year, you can just imagine what they’ll be putting out the door within the decade. Until then, we could do a lot worse than try one of these lovely seasonal issues Nine Leaves makes. The French Oak cask rums are now no longer being produced.